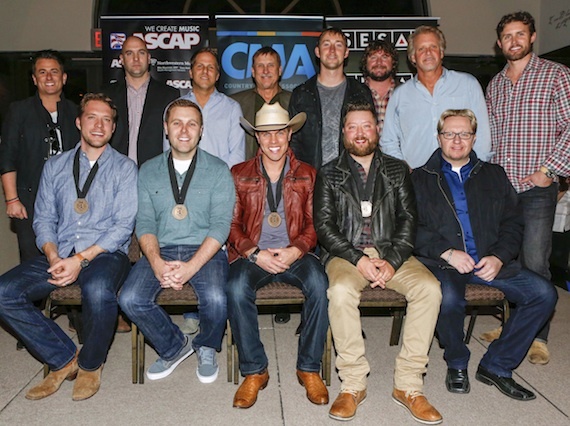 Pictured (L-R, front row): ASCAP co-writers Matt Jenkins and Zach Crowell, Dustin Lynch, SESAC co-writer Cary Barlowe, producer Mickey Jack Cones. (back row): Major Bob Music’s Jesse Frasure, ASCAP’s Robert Filhart, Broken Bow’s Jon Loba, SESAC’s John Mullins, Tape Room Music’s Ashley Gorley, Combustion Music’s Chris Van Belkom and Chris Farren, and Warner/Chappell Music Publishing’s Ryan Beuschel. Photo: Ed Rode. Music industry members celebrated with ASCAP, SESAC and Broken Bow Records recently to commemorate BBR artist Dustin Lynch‘s first chart-topping song, “Where It’s At.” The song also marks the first chart-toppers for ASCAP co-writers Zach Crowell and Matt Jenkins, while SESAC co-writer Cary Barlowe notches his second Country chart-topper. The event was held Monday (Nov. 24) at the Country Music Association offices in Nashville. Among those on hand to celebrate were the song’s producer Mickey Jack Cones, and publishers Combustion Music, Major Bob Music, Ashley Gorley‘s Tape Room Music, and Warner/Chappell Music Publishing.